The pursuit of President Robert Mugabe’s perceived allies by the country’s security forces following their seizure of power on Wednesday morning continued yesterday, with the arrest of more Cabinet ministers and government officials. Unconfirmed reports yesterday suggested that the army had also arrested police commissioner-general Augustine Chihuri and Masvingo Provincial Affairs minister Paul Chimedza. Higher Education deputy minister Godfrey Gandawa, his Agriculture counterpart Paddy Zhanda and Mashonaland West Provincial Affairs minister Webster Shamu were detained for about five hours, before they were released. Chimedza was reportedly arrested at an army roadblock in Bubi while allegedly trying to flee to South Africa. While police spokespersons Charity Charamba and Paul Nyathi’s mobile phones were unreachable yesterday, and have been since the army took charge, sources close to the developments said several ministers were frantically looking for ways to skip the country. “Shamu, Gandawa and Zhanda were stopped at the tollgate near Mount Hampden while driving to Magunje. They were detained on the road for about five hours before they were released after being told that they were not among the ‘criminals’ they were looking for,” a source close to the trio said, adding that “an army general came and apologised to the ministers for the inconvenience and let them go”. The first batch of Cabinet ministers to be taken into the custody by Defence Forces commander Constantino Chiwenga-led military includes Finance minister Ignatius Chombo and his Higher Education and Local Government counterparts – Jonathan Moyo and Saviour Kasukuwere respectively. Arrested together with the trio was youth league secretary Kudzanai Chipanga, who has since appeared on national television apologising for disrespecting the military after he issued a statement in support of President Robert Mugabe, who has since been put under house arrest. In his statement — issued in the wake of an announcement by Chiwenga warning Mugabe to stop purges after unceremoniously sacking former vice president Emmerson Mnangagwa from both Zanu PF and government, Chipanga said party youths were ready to put their heads on the block in Mugabe’s defence. Citing the country’s Constitution Chipanga argued that the military had no business meddling in politics. 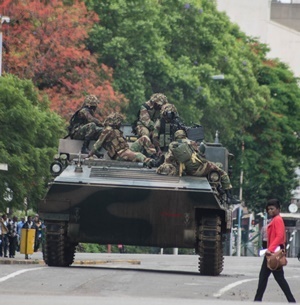 But Chiwenga’s statement was followed by a military takeover that was announced by Defence spokesperson major general Sibusiso Moyo as the authorities also said they had Mugabe under house arrest.